I love it 🙂 The Black background really makes all the bright colors *POP*! 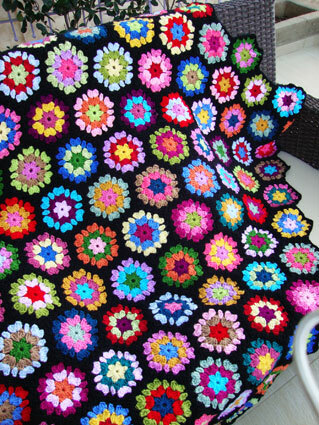 Oh boy, it really is hard not to fall in love with your blanket instantly. The black makes the colours pop and it is just beautiful. 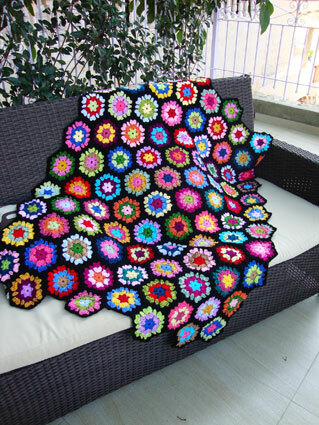 I love that blanket – one of your best, Angie! C’est merveilleux!… comme tous tes travaux! Beautiful!! The colors are gorgeous! It’s beautiful, the colours really pop against the dark background. Es una manta preciosa¡¡¡ Tengo que terminar la mía pronto. That is soooo beautiful! 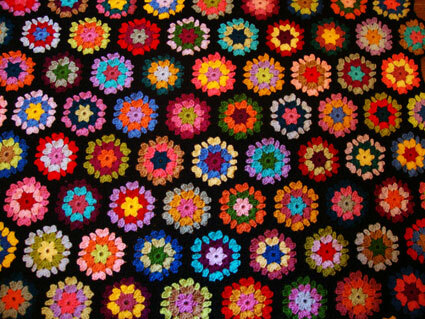 !Love how the colours pop out from the black background!! I’m in love too! Great job! It is so beautiful, I love how vibrant the colours are in their black frames. 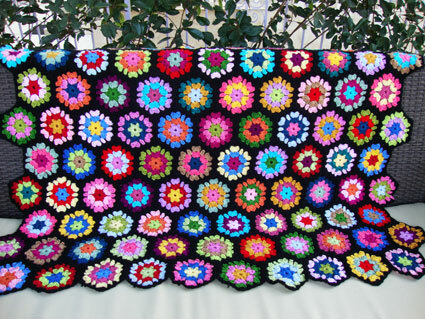 Usually I would have never thought that a border in black would look so very good, but it´s really beautiful and gorgeous. I could imagine how hard it must be to part with it and I am much admiring your generosity, your friend is surely very very happy. Encantadora, preciosa esta tu manta! yo recien comencé mi proyecto y justo es con motivos de hexágonos la cual haré poco a poco según el tiempo libre y otros proyectos en los que participo. Un abrazo de una amiga de Venezuela. Soooo beautiful!! Thanks for sharing! 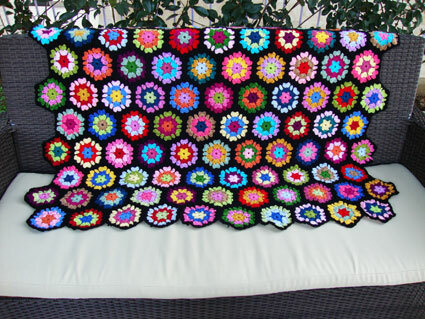 I have a question for you: do yo sell your crochet items? Have a virtual shop? How lucky your friend is to receive such a labor of love! Que te puedo decir, hermosaaaaaaa!!! Te dejo un abrazo. Gorgeous finish, Sucrette! The black really makes all the colors POP! Your friend is very lucky and you are very generous! 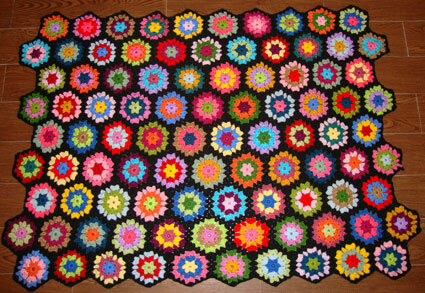 … who’s on Rnd 40 of the Giant Granny Square [I only started last week.]. I put a pic on our Flicker page you set up… thank you. 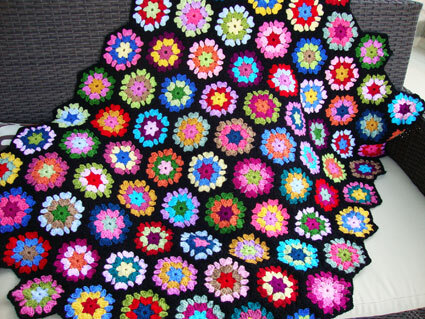 Great job on that blanket! You won an award on my blog! Come on over and pass it on if you’d like! 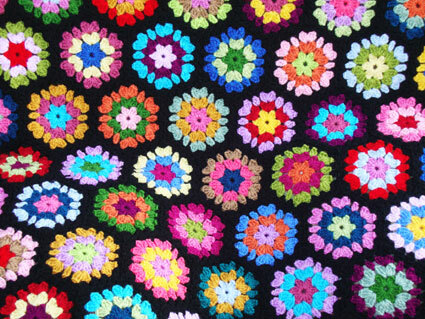 This is another wonderful blanket. What a thoughtful friend you are! I like it! It’s very very very beautiful. C’est très jolie ! 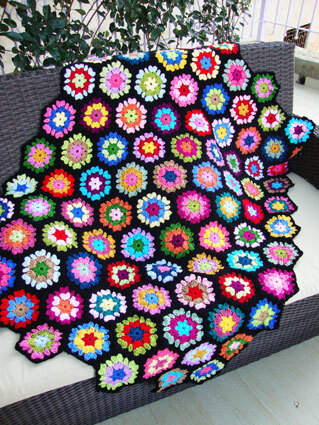 je viens de commencer un plaid avec des granny hexagones moi aussi ! Félicitations pour votre blog et tous vos magnifiques ouvrages !!! !